A few years back, my oldest daughter came home from kindergarten and looked distressed. She just learned the hard truth from school about how much damage the mankind has done to the planet we live in. She begged us to plant some trees, in hope of improving the air quality and save the earth. She worried about there will be no clean air for breathing when she grows up. Looking at her scared little face, I decided to get rid the bad reputation as a “plant killer”, started to learn gardening skills and how to live a green life with the kids. To our surprise, green living is not as hard as we thought, it even helps us to stay healthy. Apart from green basics like limiting plastic bags use and sorting trash for recycling, many families face the daily trouble – food waste. The most common problem is we can eat less than what our eyes can see. We cooked way more food than we can consume, then we sent them off the garbage disposal or the junk bay. To avoid food waste, I started to pay better attention to portion control and tried to buy more fresh and package-free products. With these changes, our diet has improved as an indirect result. My children are sensitive to chemical cleaners, they broken out in hives quite a few times before I learned the correlation. 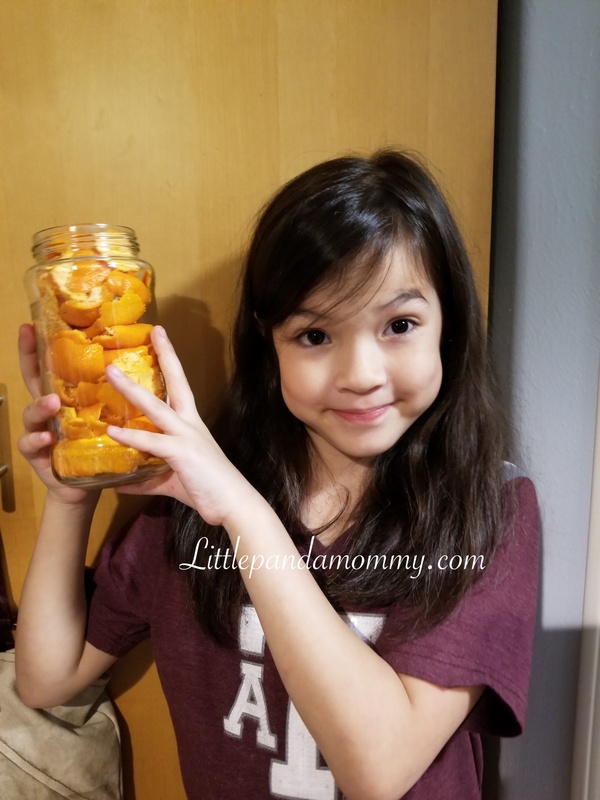 To avoid those harsh chemicals, we learned to DIY natural cleaning products to use around the house, such as “Orange Peels Cleaner” (you can use any citrus peels). This little green cleaner saves the environment and greens in your wallet and it is super easy. 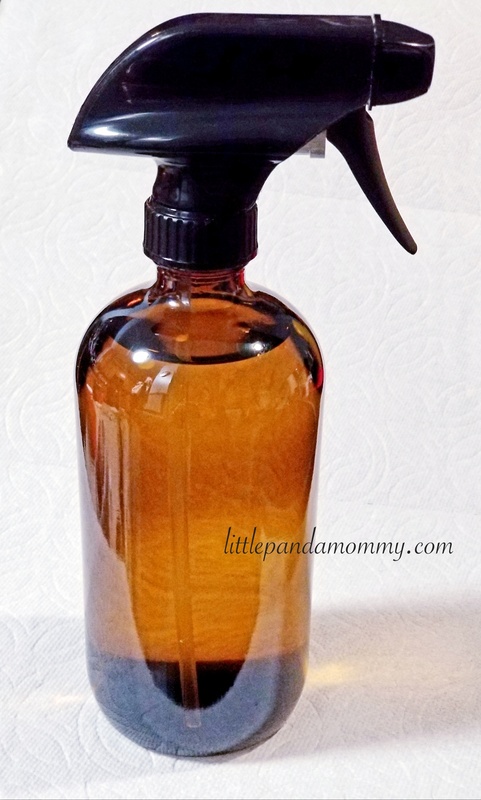 I love this amber spray bottle. Why? 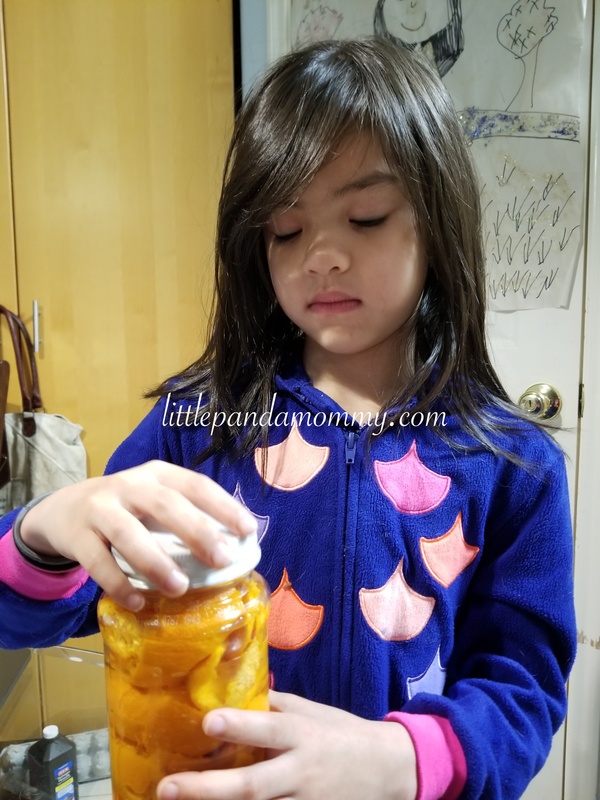 In a empty glass jar, fill it up with saved orange peels and/or citrus peels. Add white distilled vinegar to cover the peels. Close with lid and place it in a cool dark place for 2 weeks. Use it directly on tough grease or hard to clean surface, such as stove top, kitchen sink or bathroom tiles and toilet bowl. Rinse with water. Dilute it with 50% water, use it for general cleaning. For example, wipe down door knobs, table and chairs, wash dishes, clean windows. Use it as fabric softer in washing machine (use white vinegar for light and white clothes), simply fill the fabric softer slot with vinegar and run the wash cycle as usual. However, not everyone like the smell of vinegar (I am not a fan), so we combined other powerful natural cleaning agents (orange peels, lemon peels, lime peels, grapefruit peels or pretty much any citrus peels) into the mix, making the cleaner more effective and smelling good. Many food wastes are useful too. If you have small house plants or a garden, start saving your coffee grounds, egg shells and banana peels. Just put them in the soil, it will decompose and become nutrition for your plants. You can also make a indoor compost bin (buy it here) or outdoor compost bin (buy it here) with a metal or plastic bucket, drill some holes at the bottle and start filling it with food wastes. Combine food wastes mentioned above along with other fruits and vegetables wastes, tea (loose leaves tea or biodegradable tea bags) and some soil in the compost bin, stir every 2 weeks and let it break itself down for at least 3 months (add some worms to help along if you desired, but keep the citrus and onion away from the compost, the worms won’t work hard around them). When they composed, you have your own organic matters to make your plants thrive. Pretty awesome, isn’t it? 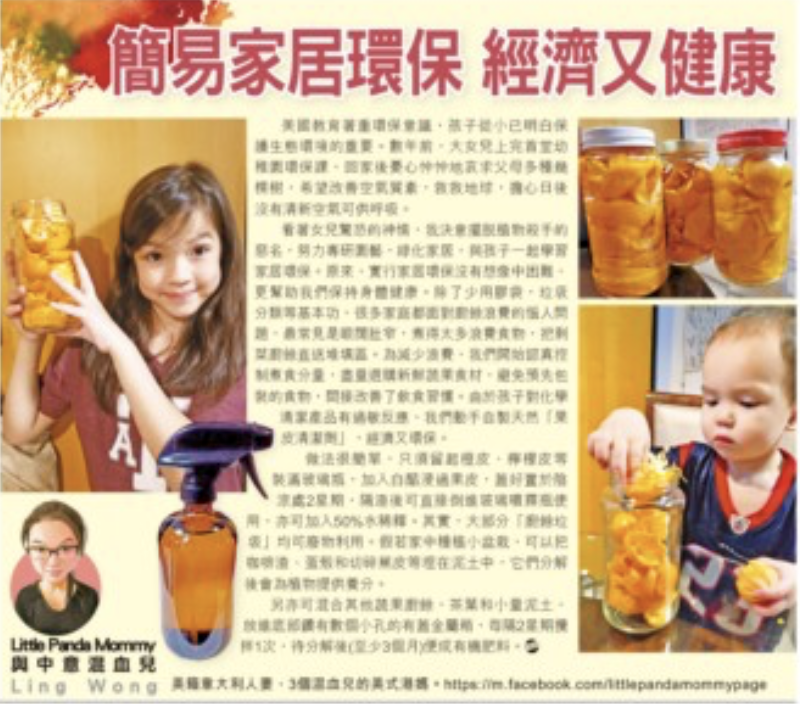 This blog post is a slightly detailed version of my published Chinese column in newspaper. You can read the original column post below. *Disclaimer: This article contains Amazon Affiliate Links. 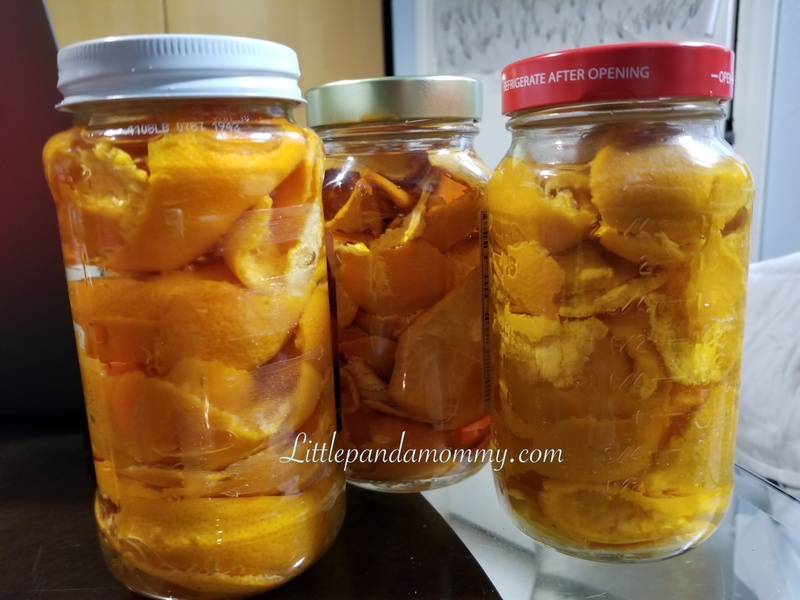 This entry was posted in Living in Good Life Style and tagged affordable, cheap, citrus cleaner, column, diy green cleaner, diy green cleaner recipe, economical, green cleaner, green cleaning, green home, green living, healthy life style, homemade cleaner, life style, littlepandamommy, living in good life style, orange peels cleaner, simple, vinager on April 16, 2018 by littlepandamommy.